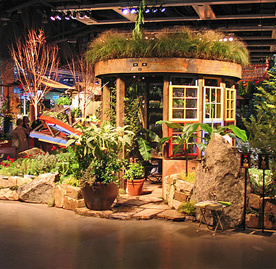 Since 2002, Exteriorscapes has participated in the Northwest Flower & Garden Show. For three years, we partnered with Seattle Tilth & The Seattle Post-Intelligencer to demonstrate the seamless connection between traditional design and cutting-edge sustainability, consistently winning awards including : 2002 -Silver Medal, 2003 – People’s Choice, 2004 – Gold Medal, 2005 – People’s Choice, Pacific Horticulture Award for best regional design, Exhibitors Award and Silver Medal. In 2008, I teamed up with friend and fellow waller, Russ Beardsley of Borrowed Ground in Bellingham, to create an unusual garden display with a focus on natural stone. We worked with about 80 tons of stone to create a garden with a beautiful and unusual diagonal, dry stack wall, gothic arch and 15′ high Inukshuk. To pull this exhibit together we imported a couple of good friends and stone wallers from Canada, Dean McLellan (Owner, Highland Masonry) and John Shaw-Rimmington. Dean McLellan of Highland Masonry in Ontario, Canada has been an amazing mason and mentor for several years. The use of natural materials has always been important to my work and in my designs. At the forefront has been the use of natural stone and, in particular, dry stone techniques. For the better part of 25 years I have been using stone and have had the opportunity to work with some of the best dry stone masons in the world. One such event is Stonefest, held right here in the Northwest, which focuses on sharing the knowledge and passion for working with stone. This event is put on by Marenakos Rock Center and the enthusiastic founders, Scott Hackney and Alexandra Morosco. I have had the pleasure of being an instructor at Stonefest for the past 4 years. Some of the photos in this section represent projects, collaborations and festivals that I have worked on over the years.